Aquamarine and diamond helix ring. This is one of our remodel projects. This particular ring was made from a multitude of old jewellery. There were aquamarine and diamond rings, pendants and chains, which were no longer being used or worn; much of which went into this new design. We spent time with our client, to identify exactly what she wanted from her remodelled ring. We had the difficult task of coming up with designs that would incorporate a mixture of gems and stone shapes into one ring. The lady wanted to have a statement ring design; something that was a little out of her comfort-zone, in terms of size and impact. She felt she wanted to have something a bit more ‘daring’. We came up with a page of design ideas, all of which ticked the boxes. 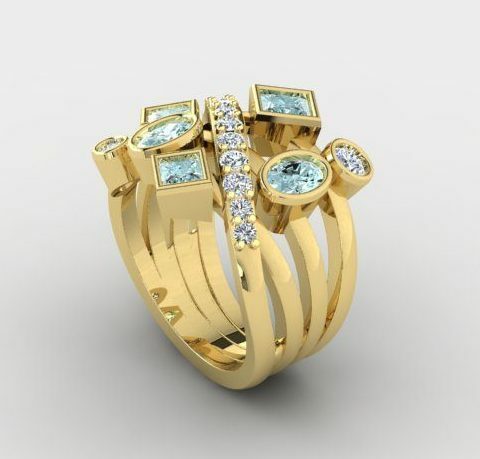 The design that she chose to go forward with, was this aquamarine and diamond helix ring. She particularly liked the width that was created by the multi-strand effect of the spiralling band. The single strand of gold wrapped up and around the finger, creating a big impact look, without the bulk of a solid ring. Clients often approach us, inquiring if we can remodel old jewellery into new pieces. This is something that we specialise in. Our expertise and long experience enable us to re create family heirlooms into new, wearable items of jewellery. Each piece is completely bespoke; chosen and made from a selection of design suggestions that have been offered to the client. Occasionally, customers come to us with little idea of what they want, relying on our longstanding reputation and skill, to extract the essence of their true style. We’re really good at this! Ruth will listen to the brief and then ask questions about the wearer’s tastes, preferences and lifestyle. This helps her to draw appropriate designs, that will appeal to the client. This intuitive ability to hone in on the wearer’s desires, sets Sherry Jewellery apart from many other jewellery designer-makers. Many clients are amazed at the ‘nail on the head’ perfection that is achieved for the recipient!